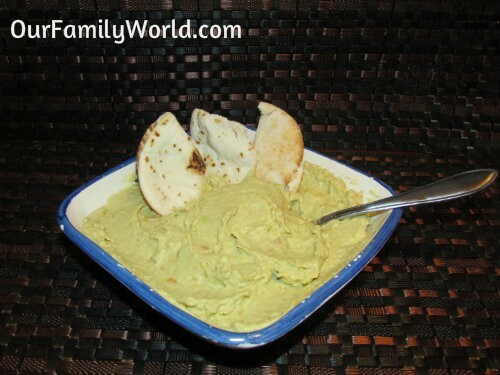 Recently I tried a little variation with the regular hummus by adding avocado to create a fun new Avocado Hummus recipe. The result was a super-hit with my family. I decided to share this recipe for all those dads and mums out there who love experimenting with food. But before that, let me tell you that each of the ingredients of this new dip have extremely beneficial properties. For example, chickpeas are a great source of protein; the garlic and lemon are filled with antioxidants and olive oil provides a good dosage of monounsaturated fats. All in all, the regular hummus offers iron, folic acid, amino acids and manganese. The addition of avocado is like the icing on the cake because avocados are known to prevent cancers and heart diseases. They are also the powerhouse of Vitamin E. While this snack is wonderful anytime of the year, it would be a great dish to serve as a healthy Superbowl snack! 1/4th cup of the syrup that is in the can of the chickpeas. 1 large or 2 medium cloves of garlic, peeled. 2 – 3 tablespoons of extra virgin olive oil. 1 ½ tablespoons of tahini paste (paste of sesame seeds). And 1 medium avocado, peeled, pitted, halved and chopped into pieces. I put all the ingredients in the blender and added a bit of the syrup that I had set aside. I started blending at medium speed and when I found the mixture to be too thick I added a bit more of that syrup. The consistency of the paste resembled that of peanut butter. I took out the avocado hummus in a nice serving bowl and served this delicious dip immediately. If you don’t want to use it immediately, you can cover it with cling film and refrigerate it. It can easily be used up to 3 – 4 days. I suggest adding a bit of Tabasco sauce if you like it to have a bit of kick in it. When I made the avocado hummus, I made a little bit extra and experimented storing it in the freezer. Let me tell you that it stays quite well in the freezer for up to 3 – 4 weeks. When I took it out and defrosted it, it was a little bit dry so I mixed in a bit of olive oil and it was good as fresh. How did you like this recipe of avocado hummus? Would you be willing to try out this recipe soon? Please leave your comments below. Delish! I added a chopped tomato as well, tastes super fresh. 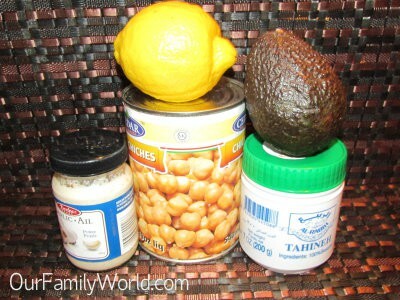 My kids have recently found a new love for hummus and the inclusion of avocado makes this something I have to try!! Sorry, I’m not a fan of avocado. I know it’s a super healthy food. But you have inspired me to try to make my own hummus at home instead of buying it from the store. Hi Joyce, please don’t be sorry about the avocado.. It is a matter of taste!! I am an avocado addict. My husband makes fun of me about this addiction so I try to add it everywhere! It is the first time I tried hummus at home. I loved it and it is super easy to prepare! I have to try this. I just tried making hummus and it was NOT good…maybe the avocado will help! If you like avocado, I am sure it will taste good! Let me know how it turns out!! Hi, I found your blog through Susie QT pies Scraps of Life. I linked in a poached egg dish. I am your newest follower. A follow back to Carole’s Chatter would be fantastic. Hope you are having a good week. I love the avocado twist on this! Yum! Speaking of hummus…have you ever tried a hummus/dill/tomato bagel? It’s one of the most AMAZING things I’ve ever tried! It might sound weird, but I promise, it is GOOD! OH!!! Looks something I want to try!! Thanks for sharing! I just love Bagel!!! I am a huge avocado fan, and I can not wait to try this! I’ve never tried making hummus with avocado! Looks delicious. 7 Things You Didn’t Know About The BFG + Fun Movie Quotes!